If you could invent a plant, wouldn't you want it to have these characteristics? Euphorbia humistrata fits the bill. It's an annual, but it might as well be a perennial because in effect, it acts like one. Once you have it, there's no need to replant it year to year. It looks beautiful draping over a retaining wall edge. A nearly identical plant (Euphorbia maculata) has unique burgundy markings on its foliage. Both grow quickly, so what more could you want in a groundcover? What? You're turning up your nose at this? I think it's time we stop trying to beat this thing and join it. It's the latest, greatest plant you never knew you wanted. If you already have it, don't you agree that it's the easiest thing to grow since...say...dandelions? I've got a good crop of it going here and I'm willing to sell you some seedlings at the bargain basement price of 50 cents per plant. How many do you want? You had me worried there for a second, Kylee. But can you eat it? That's how I'm judging the worthiness of letting a weed be these days. If I can find a reasonable use for it, it can stay. 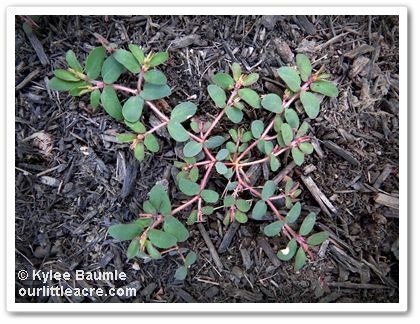 Unless you want groundcover everywhere to be spurge, it better be good for harvesting. Medicine, maybe? Carol ~ No, it's not purslane. We have purslane in our gardens too, but not nearly as much as this spurge. Purslane is a succulent type of plant that is edible and this is not. In fact, it would be dangerous to eat this, as euphorbias have a latex substance that is very irritating to many people's skin. I wouldn't even recommend pulling this without gloves.